She was working in Uganda on the launch of a mobile operator when riots broke out causing a general state of emergency for two days. She was caught in Kenya during the ethnic violence following the 2007 elections. In January 2009, she found herself in Madagascar during what was later called a coup, in Sudan during the attack on a US Diplomat, and in Nigeria, working away on her laptop when shooting erupted right outside her door. “With a high-flying job requiring constant travel, Mar Pages has spent the past decade hopping on planes to exotic destinations. So far, the former globetropping telecommunications consultant, originally from Barcelona, has visited more than 80 countries on all continents — except for Antarctica. All in the name of work. And all expenses paid. Along the way, the 34-year-old discovered that things don’t always go to plan.“ This is her story. This is about the time she found herself in the wrong place at the wrong time…five times. She has had incredible misfortune on her travels to date, having been caught up in the wrong place at the wrong time…5 times!! Learning. I believe travelers are curious minds at heart and I find that I am constantly attracted to things that are as different from my background, my cultural values and my surroundings as possible. My curiosity. I started traveling because of my job. I found it exciting to land in a different country every week, to discover that my expectations and my common sense were not necessarily common to everyone, that different sets of values existed, and that the world was a very diverse place where everything is relative. Once I started, I was not able to stop. Onboard the Maharajas Express Train, India in Luxury. 6 extravagant experiences on India’s luxury Maharajas Express train. 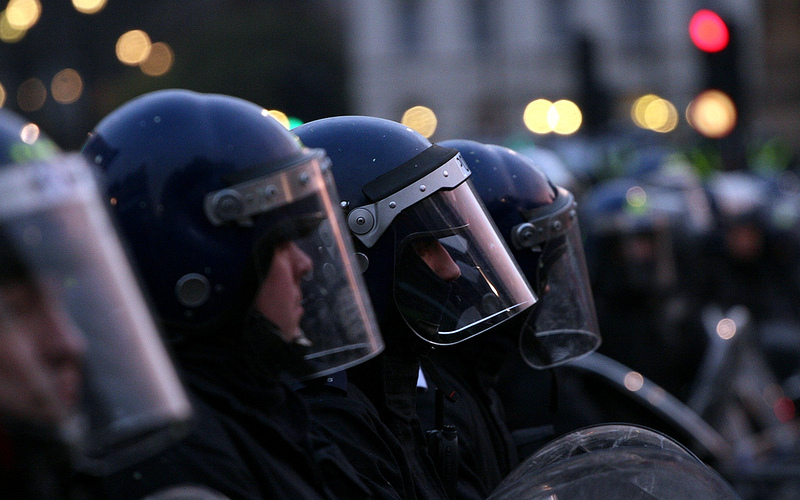 You’ve been caught up in coups, wars, political crises, demonstrations, and violence in several countries. Tell us about the times you’ve been in the wrong places at the wrong times. Whereas this may actually be the case I have had the incredible misfortune of being caught up in coups, wars, political crisis, demonstrations and violence in several countries. In September 2009 I was working in Uganda on the launch of a mobile operator for the bottom of the pyramid. We were at the beginning of the project when all of a sudden the situation in Kampala deteriorated in what was later called the Kayunga riots. The unrest emerged when the cultural leader of Buganda tried to visit Kampala and was prevented from doing so by the police. Violence and rioting ensued. Roads were blocked, cars and tires burned and a general state of emergency took over the capital for two days. As always, the international press made it look like war had erupted whereas the reality on the ground was far from that. It was a tragedy, one not to be brushed off, but it was not the start of a civil war. That would have brought more coverage and interest from the voyeuristic international press so they certainly used sensationalist headlines. The press made it look like war had erupted whereas the reality on the ground was far from that. We considered an emergency departure but the roads to the airport were closed and where the epicenter of the struggle was, so we resorted to staying at the hotel for as long as it was required. Obviously, family and friends back home thought that we were caught up in the middle of a full blown civil war whereas in fact we were trying to pass time at the Serena Hotel. We even got to share some fried chicken with a couple getting married on the hotel lawn on that same day. 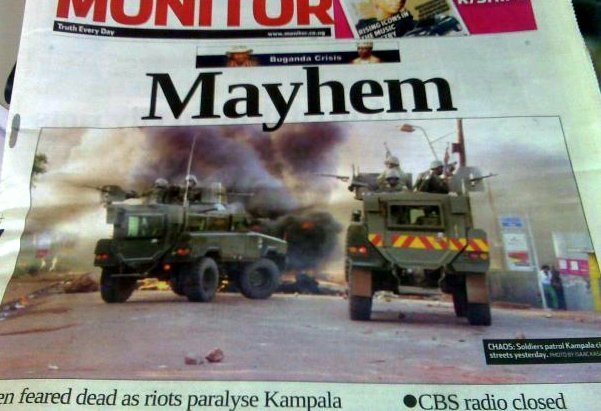 Life in downtown Kampala went on while the police killed 40 innocent people, allegedly hit by stray bullets. In a country so used to revolts, riots and fighting, this did not seem like a good enough reason to the couple to postpone the wedding. On the Saturday night we ventured out of the hotel and into a nearby bar for a couple of lukewarm beers and jazzy African music and dance. Eventually after two weeks trapped in Uganda we made it out, unscathed. We ventured out for jazzy African music. I travelled to Kenya for almost a year but the most heart breaking time was during the ethnic violence following the 2007 elections. After Kibaki’s victory was announced the opposition leader, Raila, called for mass protests to denounce the vote manipulation, confirmed by international observers. The protests quickly evolved into a wave of ethnic violence, first against the Kikuyo group Kibaki belonged to, and then spread over the course of a few months to all the other tribes as the Kikuyo defended themselves. Since this took place during the very important Christmas break, most of the Kenyan population had gone up country to their homes and Nairobi was emptier than usual. The ethnic killings, reminiscent of the Ugandan genocide, went on for months. News of what was happening in other parts of the country were patchy as communications had been cut off. Some weeks the situation was so dramatic that we even left the country mid-week in two occasions when we feared we could be stranded in the middle of a full-blown civil war. We feared we could be stranded in the middle of a full-blown civil war. Photo CC DEMOSH. When the crisis exploded we considered our options and decided that we would continue traveling to Nairobi. Most of the airlines stopped flying, reduced the number of flights or instated rules whereby the crew would spend the least amount of time possible on the ground. Emirates continued flying, business as usual for an airline so accustomed to flying to danger zones, but the seats were almost all empty. We were not fools, the situation was indeed to be accounted for and we couldn’t go about pretending everything was ok. So we contacted an emergency evacuation company and laid out a plan in case of needing to be airlifted to safety. We also moved hotels to one that was closest to the airport and monitored the situation daily. A curfew was imposed so we were simply going from the airport to the office to the hotel and back. For the most part, life went on, despite most of the economic activity came to a halt. The population was stranded in the rural areas, unable to get back into the city and went into civil war mode. The fear of a Ugandan style genocide escalated for the first few weeks and so the population cut back on any non-essential expense and stocked up on food and fuel. Working for the mobile operator we tried to control the downtimes but some parts of the country were isolated and couldn’t be reached safely so fuel for the towers could not be re-stocked. Eventually things calmed down and normality returned, but not before months of killings and violence. The remnants of the ethnic fighting still lingering on everyone’s minds. The remnants of the ethnic fighting still lingering on everyone’s minds. In January 2009, Madagascar suffered what was later called a coup. Although I was not specifically on the ground on that day, I was scheduled to fly and I had a team in the country. I was regularly visiting Antananarivo for a six-month period. Every week I would visit at least two of the four countries where our project was taking place: Uganda, Kenya, Tanzania and Madagascar. As soon as the violence erupted, as the Mayor of Tana proclaimed the President’s loss of power things worsened. The instability and the back and forth between the Mayor and the President ended with fleeing and with illegal declarations by the Tribunals. I love Sudan. I can’t explain why or how or even what it is about the country that I find so special but it is a country where I spent a significant amount of time. Like Paul Theroux I fell in love with this dusty desert of sand dunes and simple living. I fell in love with this dusty desert of sand dunes and simple living. If you visit any of the Foreign Ministries of any Western Government Sudan has been deemed a dangerous place to be avoided unless strictly necessary for the best part of the last two decades. While this may be an accurate image of certain parts of Sudan, Khartoum always felt extremely safe. Except for that one time a US Diplomat working for the Agency of International Development was shot dead on his way home. On the ground there was tension and I remember feeling slightly squeamish because Khartoum had always been such a safe place. We used to hail down regular cars to get a ride back to the hotel in the evening as taxis were not always available. This certainly made us all slightly more aware of the realities of a country where so much suffering and war is taking place. Nigeria is on the top of my list for places I would never return to. This is because of a mixed bag of reasons both factual (violence, kidnappings, ethnic strife) and also because I just never felt welcome, wanted or even respected in any aspect. For the three months that I traveled to Lagos all I felt was corruption, bribes being asked at all points, officials trying to steal my clothes from inside my luggage or money from my wallet, rudeness, queues, humidity, pollution…I could go on. Nigeria is on the top of my list for places I would never return to. But a moment that summarizes it all happened on day we were working in our office on the, theoretically, safest part of the city, Banana Island, where the business center is. As we were working away on our laptops we started hearing shooting outside, by the main door. It turned out that two men were arguing about a parking spot and one had decided to take the gun out and solve it like that. Needless to say we moved inside far away from the window. The entire time in Nigeria was a lesson in truly living in a place where safety is a major concern. We had tinted window cars with curtains, Kalashnikov-wielding guards escorting us to and from the airport and stopping at nothing, and we were, obviously, never outside of the hotel or office. It was claustrophobic and extremely dangerous. The worst part of all was dealing with the authorities/police. Being in Nigeria, anytime, is being at the wrong place at the wrong time. What is the first thing which goes through your mind in one of these situations? I go through a decision tree. How bad is it really? Should we leave? I have learned that the media cannot be trusted in these situations and that the best proxy is the security services at the Client we work for. If we are encouraged to leave, when is the next available flight? Can we get on it? Is it safe for us to wait until then? If not, we would contact the evacuation company and consider being airlifted. The reality is that none of the situations I found myself in were life threatening and, we could either wait for things to calm down or take a safety stance and get on the next available commercial flight. I go through a decision tree. Photo CC Bob Bob. What kind of steps do you take to ensure your personal safety? I always leverage the opinions of those who know best. In cases of conflict, the security teams at the client we were working for were the most truthful and reliable source. 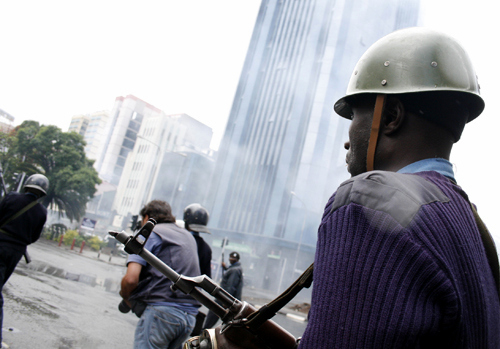 Security companies are conflicted as they make money for over exaggerating the situation. At the same time, they are likely to err on the side of caution because they can’t provide you with an advice that may be too risky and their selling proposition is the fact that they know how to manage situations of risk. Aside from all the situations I described above I do regularly travel to places where security is a concern. I was recently in Pakistan and, although I have extensively written about the need to bust all the myths about this heritage-rich and warm country, I visited with the full understanding of the real risks. I got in touch with someone who is well established and connected and who had a good understanding of the security situation. I did not wander off around Lahore by myself and I always ensure I arrange a reliable driver to take me around. 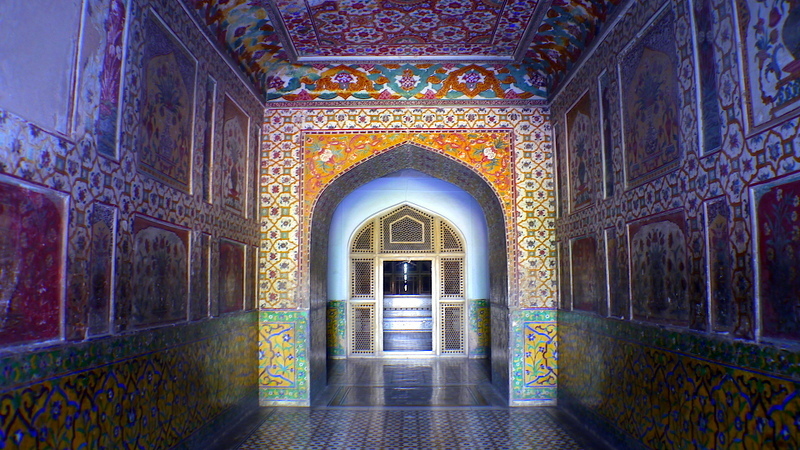 Lahore Jahangir’s Tomb, Pakistan. I do regularly travel to places where security is a concern. The reality is that, aside from these unusual conflict situations, the most dangerous place I have ever been to is South Africa, where I was living for eighteen months. Joburg can be an extremely dangerous place so I followed the golden rules my local friends shared with me: never stop at night at a traffic lights; don’t fall for the road blockage scam; don’t argue with the police, chances are the bribe they are after can be resolved with a burger from McDonalds or a small note, so have change ready in the car. And so on. The most valuable piece of advise I can give anyone is to be vigilant, wherever you are. What is your opinion on the importance of travelling with health insurance while abroad? I think it is essential and possibly the most important item a traveller should have in check. During all of my years on the road I had full travel and health insurance coverage for all the countries. My work health insurance policy covers me everywhere in the world for elective or emergency treatment. I can see a doctor in whatever country I choose to. Emergencies have always been covered under my policy, including air evacuation if needed for treatment. My policy also covers repatriation of remains, life Insurance, disability, etc. It is important to make sure that you are covered in cases of Force Majeure and/or war. Given that my job regularly involved places where this was a real risk this check box is ticked for me. It is also important to include the cost of prescription drugs in the policy – some travel vaccines or preventative drugs, in particular Malaria treatment, can be extremely expensive. Even birth control treatments can cost a fortune in some countries. These are all elements to consider when purchasing health and travel insurance. Terrorism and other Natural Disasters are more and more widely spread and no longer the reality of the world’s most isolated places. Earthquakes happen in Nepal but also in Japan or the Philippines. Above all, when tragedy strikes, you want your insurance to take care of it all. It is in those occasions when a really good policy shines. What other precautions can people take to ensure they are covered if they find themselves in the wrong place at the wrong time? Always let someone know where you are. Itinerary, contact numbers or names of hotels you are staying at. And leave it with someone who is constantly thinking of you, someone who would notice if you went missing for a day. A satellite phone is a good way to ensure that you can be reached in case of emergency. These will work even when the telecoms network is down like in cases of terrorism, natural disaster or isolation. Believe it or not, large parts of the world are still not covered by mobile signal. I always carry cash in my wallet, you never known when you might need a deposit to guarantee payment for treatment. US Dollars have the highest value, but make sure you carry new notes, always from 2009 onwards, or you may struggle in some parts of Africa where counterfeit is common. Keep contact numbers for your insurance, particularly of the services they provide on travel advise and support in cases of emergency, handy. Somewhere in the belongings you carry everywhere with you, have the number of a next of kin and your blood type, so, in case you are unconscious, the hospital knows who to contact. Make this visible with instructions, “In case emergency contact XYZ”. Let this be someone who speaks English, even if that is not someone in your family, so they can communicate with the hospital. And make sure this is not someone who is regularly unreachable. Re your insurance, read the fine print and understand what you are covered for and not before you travel. If you are going to participate in activities that are out of the ordinary check that you are covered. Also, ensure you are covered in all the countries you plan to visit. The US is notorious for being frequently excluded because of the high medical costs. Countries that are considered at war may also be excluded as Insurance companies consider the risk you are taking being your own responsibility. I broke an arm in South Africa after falling from a horse in a team building activity. In Kampala, the situation escalated out of nowhere in a country that was largely safe and peaceful, nobody had ever mentioned the spiritual leader that was the source of the conflict before. Khartoum was extremely safe before the shooting took place. My friend getting stung by a stingray was simply walking on the beach of the luxurious Kempinski Resort in Zanzibar. These things can happen to anyone, even in a developed and safe place. On my series on “Moments which resorted my faith in humanity” I often receive stories of travellers who found themselves in some sort of health emergency and were helped by strangers. Although I believe most people are kind and helpful, you don’t want to have to rely on strangers. It really is better to be safe than sorry. 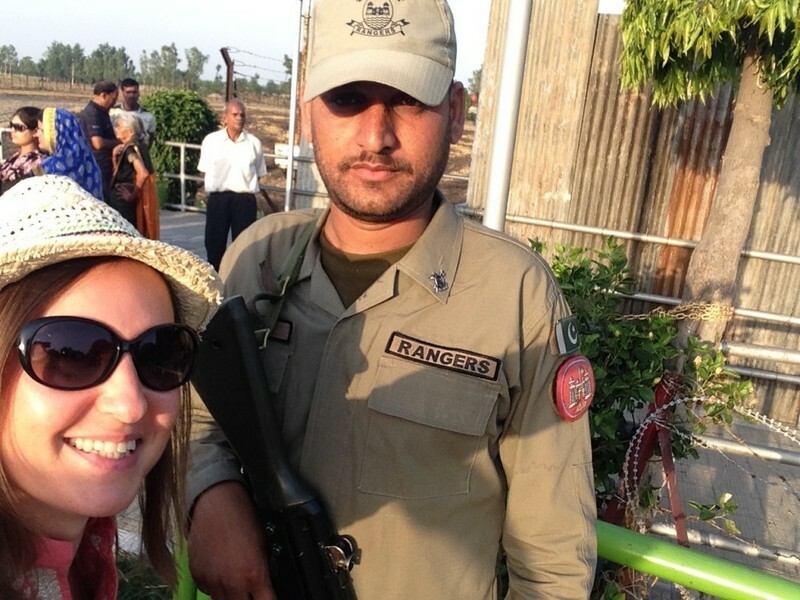 Selfie with the border rangers at the border between India and Pakistan. Get proper and extensive coverage. When things go wrong you don’t want to have to worry about payment or about not getting adequate treatment because your insurance didn’t cover you for this. In South Africa, despite my best in class insurance, the hospital would not accept me without pre-approval from my insurance or my American Express as guarantee for payment. Have a credit card with a high credit limit ready as well, but be careful about fraud. I have found Amex to be great in these situations as they are a benchmark in fraud management. Bear in mind that hospital bills, even in developing countries can be outrageous and put you into serious debt. My five days in South Africa with the operation and a shared ward reached close to $10,000. Talk to someone who has been there before, ideally someone who shares your style of travel, who would be scared, worried or excited for similar things and get their insights. Planning is important but more often than not, for countries where security is a concern, no book or travel guide will be able to tell you the implications on the life of a traveller like another traveller can. Plus books go out of date very quickly in today’s fast changing world. Leverage the age of technology to find someone who knows someone who has been where you plan to go. Don’t be afraid to reach out. People who like to visit places nobody goes to appreciate the reality of such destinations and will gladly share their experience with you. And you can always reach out to me, I have been to my fair share of the least visited countries, and have many friends who have visited over 100 countries. Chances are I will be able to direct you to the right place for real advise. You can see the countries I have been to in my map. Travel proves that people are good in nature and that we treat others how we would like to be treated ourselves. Don’t let fear keep you at home. Pro Tip: If you haven’t yet purchased international travel health insurance, do yourself a favor and make sure you do. We go through Timothy Jennings at Individual Health for insurance with #GeoBlue – a worldwide insurer who offer the most complete set of benefits and services in the industry, and cover everything Mar mentioned was important above. Photo Credits: Feature by Ivan Bandura, Pinterest Images by The National Guard & nsahusse. African dance by Anna Carolina Vieira Santos & goooder. Kenyan man of Samburu County by Africa Progress Panel. Sudanese Farmer by United Nations Photo. Sudan Sand Dunes by Dia Eldin Khalil. Nigerian Child by Orbis – Giving the gift of sight. Female Treatment Team by DVIDSHUB. USAG- Humphreys & DFID – UK Department for International Development. Mar is an ultra-frequent traveller. She has lived in six countries, travelled to almost ninety and is constantly on the look out for the next adventure. Her travels are out of the ordinary. Be it because they take her to places nobody goes to or because they involve the finest things in life. You can find her equally lost in a head-turning destination like Djibouti or Sudan or in an island luxury resort in French Polynesia, the Maldives or Mozambique. Read about it all on www.onceinalifetimejourney.com, or follow her on Facebook, Twitter or Instagram. I served as a security manager for an international organization and would always recommend to the employees and those visiting foreign countries to register with their Embassies whether it is a volatile region or not. It takes a few minutes and you’re accounted for in case of emergency. Fantastic tip Jessica – I always try to make a point of doing this as well, Australia has a website called Smart Traveller set up, so it really is only a couple of minutes and you’re done. What great advice, and harrowing stories! I’m glad you’re ok.
Glad you found the tips useful Jessie :) I believe this week Mar will be battling the traffic in India, so we wish her luck there too! OMG you have had some stories to tell happen to you during your travels! Glad you are safe, and keep safe while traveling. Doesn’t she!! People always travel and think that it’s never going to happen to them, but if it can happen to someone 5 times, then those who travel without insurance really are taking a huge gamble with their life. Wow and she’s still alive. What an amazing, brave woman. Braver then me and I travel with kids haha. Isn’t she amazing! And it hasn’t stopped her passion for experiencing the world – I believe she is battling the traffic in India later this week! We’ll keep her in our thoughts that she comes through that adventure also!! Great read! But what does this woman do? I never could figure it out. I can say I’ve had to rely on strangers before and happily, it did work out. I contributed to one of those articles! Also the travel insurance thing, I was in the US but wish Id had additional travel insurance. My ambulance ride cost 3000! Glad you enjoyed the post Penny – Mar is a telecommunications consultant, so travels to different destinations to consult on setting up mobile towers etc – that sort of thing :) Hence I believe why she’s in such remote areas a lot of the time. Glad to hear you contributed to one of her stories that restore your faith in humanity – small world! And I’ve definitely learned that too – that the kindness of strangers really can be so touching when you’re traveling abroad. People I’ve found are over-all very friendly and always willing to help foreigners – their main interest usually seems to be making sure you’re enjoying their country as much as they do! And OUCH re the ambulance cover!!! That’s insane!! And I though $500 in Australia was overpriced! :S! This is such a great reminder to folks who don’t believe in travel insurance. I can’t believe one woman could have so many (mis)adventures. Thanks for the tips re: keeping insurance contacts handy, letting folks know where you’re going to be approximately when travelling and your blood type with you. When you read them they seem like simple, common sense things to do but how many of us actually do them? Great profile Megan. Thats what I thought as soon as I heard her story!! So many people have commented to me previously that it’s never going to happen to them, well, if it can happen to one person 5 times, you bet it can happen to any one of us at least once!! Travel insurance is something which is far too valuable to travel without – no matter how invincible we feel we are. Glad you enjoyed the profile Miranda :) I’ve long since realized that it’s usually the simple straight forward tips which most people overlook! Yikes! Fascinating and jarring reminder why insurance is the way to go. Very vivid stories! Absolutely – it’s sad to think that we need to shock people into making sure they’re adequately covered by insurance, but I really do think people need a jarring reminder sometimes to make them realize it’s not something you should be traveling without. Glad you enjoyed the post Lillie :) Travel safe! Travel insurance is a topic that I read about a lot on travel blogs. Should you have it or not? Well, my advice and certainly after reading these stories: yes! I have to admit that I was very intrigued with these stories (and I read a lot of travel stories I can tell you). Especially Kenia whose events also on me left a huge impact. And the worst thing about all this are the local citizens, especially the children. So many people live in dangerous places, their present and future uncertain. After this post I grant myself lucky to live in a safe country like the Netherlands. Glad you’re advice is also to make sure you’re covered Emiel! It really isn’t ever worth the risk to travel without – even a short local trip could have you needing domestic cover, so it’s always a valuable safety net to have. I’m glad you enjoyed the article, and can take away from the stories a sense of being grateful for what we have in the Western world. It really is a blessing to have been born into a safe country when there is so much turmoil around. And I think it’s nice to think that we’re invincible…but not exactly practical when it comes to keeping yourself covered with safety nets like insurance! Smart Traveller is a great tip for Australians – it’s generally my first port of call as well before I take off on a trip. Thanks for the tip! Whoa, you are badass! My mum (and myself also, let’s be honest here) would die with worries if she knew I was in places where security is a concern. I think the biggest thing to maybe take from this though is that security is possibly a concern everywhere we go, so really the biggest thing to dealing with those worry’s is to make sure you’re (a) set up with the safety net of insurance should you need an emergency evac or medical help, and (b) also to be continually making yourself aware of the political climate of the destination you’re in. Often it’s not tourists who are the target in situations like this, though totally agree that that doesn’t make them any less scary! Amazing stories and you just never know what the day will bring. No matter if you are living the life of travel or not. It is always interesting to be in a place that hits the media, to see the reality versus the hype. We are currently based in Mar’s home country and we find it fascinating, but just like her we are very curious to see it all. Thanks for the wise tips too. Glad to hear from you Heidi – I totally agree, I’m always curious to step onto the ground and see these destinations first hand to compare the difference between reality and the media hype. As Mar said, often when security situations like this occur it’s very rare that tourists are the target. Doesn’t make the experience any less scary, I’m sure, though always something to keep in the back of our minds should something like this actually occur. Wow! So many crazy incidents! Great interview. Definitely good advice about the insurance–you never know when you will need it! My goodness, what experiences you’ve had. It sounds like the life of a foreign correspondent, but even more so as you’ve gone through this in so many different places. I’m glad to know that often other people reached out to you – that’s heartwarming. Doesn’t it! I always thought the life of a foreign correspondent would be fascinating! Definitely action packed with no time to be bored!! I’m so glad Mar highlighted the kindness of strangers in this interview – people people really are warm hearted and willing to help out, I think it’s a widespread misconception that you shouldn’t trust anyone when traveling abroad. Wow, this lady has gone through some thing in her life.To be in the wrong place five times and live to tell the tale is amazing. On a separate note international travel insurance is vitally important, being aware of your surroundings and taking as few valuables as possible does help the average person on holidays. Isn’t it though!! Most of us don’t think we’ll ever be in the wrong place at the wrong time even once, but if it can happen to someone like Mar 5 times, then it’s silly to believe that we’re fine to be traveling without insurance. Thanks for stopping by :) Travel safe out there! Wow that’s so brave…. I do avoid travelling to places with political unrest. In regards to travelling with cover I always make sure u iam.. Thanks for sharing your experience. Glad to hear you’re always traveling with cover Anne :) It’s one of the most vital things we should have before we leave :) Happy travels! I loathe boredom and repetition as well. I think that’s something us travelers all have in common! I used to never get travel insurance, but now — in my thirties — I won’t leave the country without it. I think everyone who travels does :D Quickly shows you that you don’t have to live a life of 9-5 chained to a desk day in day out! Travel breaks that monotonous routine, and it’s definitely difficult to go back once you’ve crossed over to the other side!! Glad to hear you won’t leave the country now without your insurance in tact – it’s not worth the risk at all. Definitely better to be safe than sorry! These are intense stories and such amazing memories (now that they can be looked back upon from a position of safety!). It’s a great reminder of just how important travel insurance is – you never know when you’re going to need it! Oh absolutely! You really never know when you’re going to need to rely on insurance, and then thing is it doesn’t have to be a political crisis like Mar has been involved with, it could honestly just be something as simple as tripping on a walking tour and breaking a toe. So always important to have this on hand. Travel safe guys! Travel insurance is a given. But this is a really amazing story. So many times. Thankfully, all is well and you can tell the story. It’s always good when you can step back out of a situation, look back and say, at least I now have a story! Wow, this was fascinating – and terrifying. Luckily, we have escaped places right before some very scary events, and I am so grateful. I don’t think I would visit any blatantly risky places any more. So glad to hear that Lois – it’s definitely a scary situation to be in when you’re on the ground in the midst of political unrest, so I’m glad to hear you managed to avoid getting caught. Happy travels – stay safe out there! I’m surprised Egypt didn’t make the list. 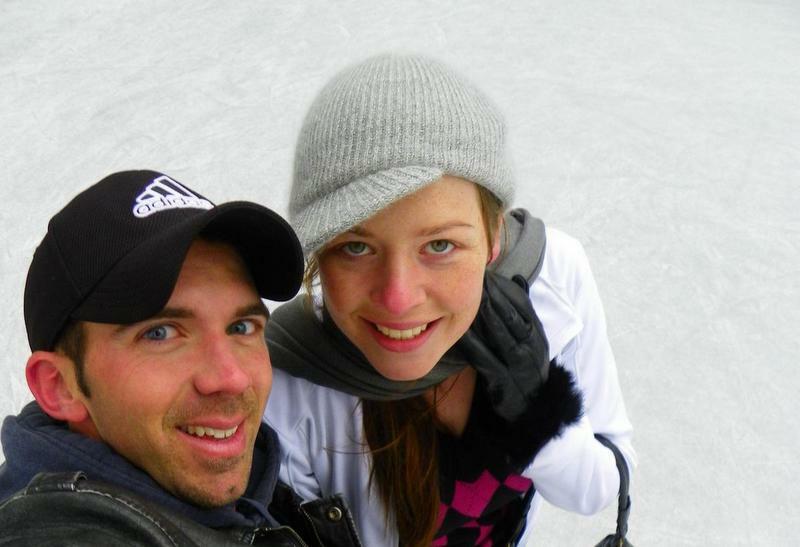 There are many stories of travel bloggers finding themselves amongst the revolutionaries in 2011. Jaime Davila is one of them. I’ve also heard many stories from travelers finding themselves caught up in issues in Egypt – granted, this post is just one person’s travels as opposed to a collaborative round up, but you should check out the interview we did with Justin Carmack about when he was wrongly accused in Egypt and locked up for a few days. Crazy story! Wow! What an incredible story. She also provides very useful tips. A good friend of mine was in Greece when they had those riots and these practical tips could have helped her a lot! So glad you enjoyed it Anna – Mar has some very useful safety tips indeed! Definitely keep them in mind should you find yourself in any of these situations in the future (knock on wood). I’ll keep my fingers crossed though that you dont! Wow! Such incredible stories! You certainly inspire that adventurous spirit in me. Love hearing your stories, and love hearing your reactions! The media is so quick to exaggerate situations, and like you said, this kind of stuff can happen to anyone, anywhere. Thanks for sharing some of those practical safety tips to travel smart wherever you go. You’ve definitely lived to tell a brilliant tale! And in such exotic locations no less. I was a bit scared in Istanbul when we’d suddenly see the police in anti-riot gear ready for some chaos, but thankfully all was peaceful! So glad to hear that Istanbul was peaceful Revati :) As Mar mentioned, a lot of the time it’s not tourists who are being targeted during these kind of protests or riots, though definitely scary to be caught up in none the less! I guess it’s not really something we know until we’ve experienced it Zof! Hopefully you never will have to, though at least now with Mar’s safety tips you’ll be set with some resources for how to act and who to consult :) Travel safe! You are a trooper! I truly appreciate your honesty about your experiences and it’s fascinating to read about how things really are, compared to what the media says. She really is!! So glad to hear you found the interview interesting Alice – it really is better to hear from those who’ve been on the ground than from the media who need to often exaggerate situations for their ratings! Wow what incredible stories!! How cool to have visited such exotic places….and I feel like these stories show that it’s okay to face the danger sometimes! Great read with some impressive experiences. On the negative side, I’m a bit sad to hear about South Africa. I still don’t understand why some people don’t take full insurance. This is a great reminder. I don’t understand that either Hugo. Also sad to hear about South Africa, though I think it does prove the point that it’s often the bigger tourist destinations where tourists are actually targeted that present more of an issue than those destinations off the beaten path where the political unrest and violence is directed solely at the government and/or local community. Wow! There are some stories!! I have been in the wrong places a few times, but nothing like this! Great advice on insurance as well!! There certainly are!! Glad you could take the advice on board Karilyn – safe travels going forward! Mar is really a tough girl! I still don`t find myself ready to travel to Africa and she ha been to all those places and situations? Wow! 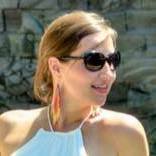 I think you would really love Africa Natalie – you can start with much safer tourist destinations which are common places to travel like Tanzania, and then go forward from there if you decide the travel experience suits you. There’s so many amazing experiences waiting in Africa it would be a shame to miss out! Wow, these stories could make almost any traveler a little afraid but the advice the comes along with the stories is spot on. Violence can happen in any city, state, or country and at any time. It’s best to be prepared and always let someone know where you are, have some cash on hand and know how to say a few words in the native language (if possible). When we were in Athens, a couple of years ago, there was a lot protesting and issues with immigrants so we were told to be extra carelful during our stay. We didn’t have any issues but we were prepared nonetheless! Absolutely Mia – I think that there’s a great teaching opportunity to come from these kinds of experiences, and the opportunity for others to learn from what happened and learn what they should do should they find themselves in a similar situation. We can all learn from each other to make travel a smoother process through our stories and joint experience! So glad to hear you made it out of Athens alright; a lot of the time it just comes down to common sense and being aware of your surroundings – as you were instructed, just being extra careful. Most of the time you’re going to be absolutely ok, though as you said, it’s always a good idea to be prepared nonetheless. Thank you for sharing the story of such a brave and remarkable women. When you are just going about day to day life you don’t really think too much about what is going on to other people around the world. So reading things like this is a good way to become more aware. I’ve had a few near misses in my travels but never anything quite as scary as the situations Mar has been in. What I love most about this story is that you’ve turned some negative experiences into a way of highlighting the incredible importance of good quality travel insurance. To me it is a no brainer to always have it but others I have come across just think bad things probably won’t happen to them. And they are right, they might not but all it takes it one bad moment for you to need that insurance. Anyway thanks again for this awesome post. So glad that you appreciate the interview from an opportunity to learn and grow. My approach is that we can all learn from each other to make travel a smoother process through our stories and joint experience! I think that if this can happen to one person 5 times, granted she did a lot of travel to unstable regions of the world, but the key thing to take away is that it could really happen to any of us at anytime. So it’s important to know how to react and that insurance in these cases is key. Wow what an incredible story and such an exciting life! It’s interesting to hear someone’s opinion about life in countries that are rarely visited by foreigners and aren’t widely covered in the media. Absolutely Sophie – and I think it’s important to listen to these stories from people who have actually spent time on the ground as a tourist as opposed to sourcing our opinions and facts straight from the media who often inflate a situation for the sake of their ratings. This is so educational! It’s great, scary and refreshing to learn about life that is so drastically different from what we’re used to… Thanks! Glad you found the interview resourceful Olga :) Travel safe! I haven’t been through such extreme situations, but I have had my share. I was in New York on 9/11 and in London on 7/7/2005 and it was… weird, surreal. I did not feel unsafe, but knowing that the rest of the world was watching what was happening there, while I was actually living it, made me shiver. One good thing that the Italian government has done is putting in place an online system through which people who are travelling can record their itinerary, contact numbers of the places they are staying and so on. It’s not so easy to record anything for those who travel long term, but surely important to do it when visiting risk areas. It’s a way for the government to know who’s where and being able to get in touch if violence escalates. Wow, thanks for sharing your experiences Claudia – I can’t image the atmosphere and what it would have been like to have been on the ground in NYC during 9/11 or in London in 2005. Really does go to show that it’s now just obscure places with political unrest where you can find yourself caught up in one of these events, and that insurance really is so important because of that. We’ve got a similar government system here in Australia called Smart Traveller where you can register online so that the govt has records should you be overseas when something breaks. It’s a very good precaution to take on top of an international health policy too. Thanks for sharing your experiences and for the tips. Such a brave woman! My gosh, her story is just something and despite being in the wrong place several times it doesn’t stop her from doing what she is doing. Hats off to her ! Also, good advice about the travel insurance. A lot of people seem to think that bad things can happen to everyone else but them. As a traveler, it can happen to you so its best to have insurance. Yes she is, though I’m so glad I had the chance to present this interview, because despite what we may have been hearing back at home at the time of each of these incidents, it sounds like life on the ground for tourists was generally decently safe so long as they were smart and took extra security precautions. Thank you for sharing this story. I am glad you are okay. I totally agree with you that you cannot trust media in such situations. I am in general pretty carefully what to believe and not to believe. Often the first reports a couple of minutes after something happened are the most reliable ones as they cannot filter things that fast. Very good point Tim about the first reports being the most accurate – going to remember that from now on when I’m taking in coverage of an international event from home! Her story is crazy! I had a couple of close calls since I started travelling full time and luckily nothing happened. Fingers crossed! Also since then I use travel insurance for every trip outside Europe. Essential! Wow. I can’t believe that all happened to the same person. Mar, you are quite brave and have a great outlook…most people would have stopped traveling after even one of those incidents. Megan, great reporting and great reminder of the importance of insurance! It’s crazy right! Goes to show that if all that happened to just one person, we’re crazy if we continue to travel and think in the mindset of “it’ll never happen to me”. What was an incredible read! Mar’s life is fascinating! I can’t imagine being in those situations, but they can happen, totally out of our control. This was a good reminder to always keep the Embassy and friends and family in the loop about where we’re going-something we don’t do a great job of currently! Thanks for this Meg and Mar! Glad you enjoyed the interview Jennifer – absolutely a good reminder to keep your embassy and family and friends in the loop regarding your movements. We like to think we’re totally independent, but there’s nothing wrong with taking out security precautions and letting people know where you’ll be. She’s definitely an inspiration! I’m fascinated with her off the beaten path travels! Great read! Having been through massive earthquakes, tsunamis, and typhoons I now feel lucky to only have fought nature.